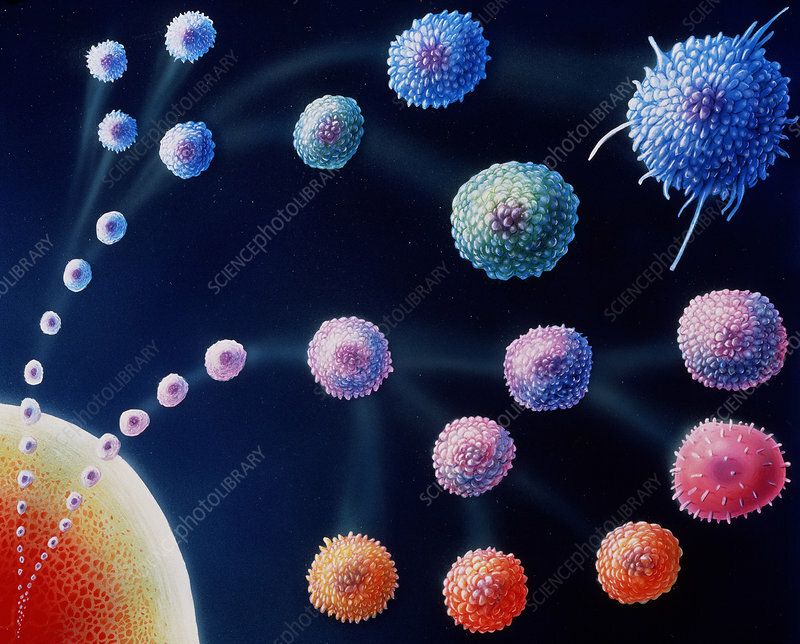 Artwork featuring different types of white blood cells that comprise the orchestra of the human immune system, the body's defence mechanism. The maturation of cells derived from bone marrow is featured at bottom left. There are three main types of white cells - lymphocytes, leucocytes and monocytes (the large macrophage at top right is a monocyte). Lymphocytes originate in the bone marrow & mature there or in the thymus - hence the names B-lymphocytes (blue, centre right) and T- lymphocytes (orange, bottom). B-cells produce antibodies, chemicals that disable invading microorganisms. Some T-cells attack other cells infected with viruses directly.